The Southeastern Chapter of the Society of Nuclear Medicine and Molecular Imaging (SECSNMMI) presented Norman E. Bolus, MSPH, CNMT, FSNMMI-TS, with the Marshall Brucer Award, the highest honor that the chapter can bestow upon a member, during the SECSNMMI Annual Meeting, held October 6-8, 2017, in Birmingham, Alabama. Bolus was recognized for his many years of service to the nuclear medicine profession, as well as his leadership at local, regional and national levels. The Marshall Brucer Award is given to a chapter member who has dedicated his/her life to the specialty of nuclear medicine and given distinguished service to the chapter. Established in 1991, the award honors Marshall Brucer, who became the first chairman of the Medical Division of the Oak Ridge Institute for Nuclear Studies in 1948. He coined the term "nuclear medicine" and convinced the U. S. Atomic Energy Commission to allow use of radiotracers in medicine with appropriate training—setting the groundwork for the residency structure in place today. He was an author, storyteller and educator, and almost single-handedly organized and formed the Southeastern Chapter of the Society of Nuclear Medicine. He served as the chapter's first president (1957-1959) and was the fifth president of the national society. Bolus is assistant professor and director of the Master of Science in Nuclear Medicine Technology (NMT) Program in the Clinical and Diagnostic Sciences (CDS) Department, School of Health Professions, University of Alabama at Birmingham (UAB). He is also the interim director of the Master of Science in Health Physics Program, which he helped establish in 2016. His many leadership roles through the years include serving as secretary, treasurer, and president of the Alabama Society of Nuclear Medicine (ASNM). Bolus currently volunteers as the ASNM associate treasurer, a position he has held since 2011. In addition, he has given lectures at nearly every annual meeting since 1999. 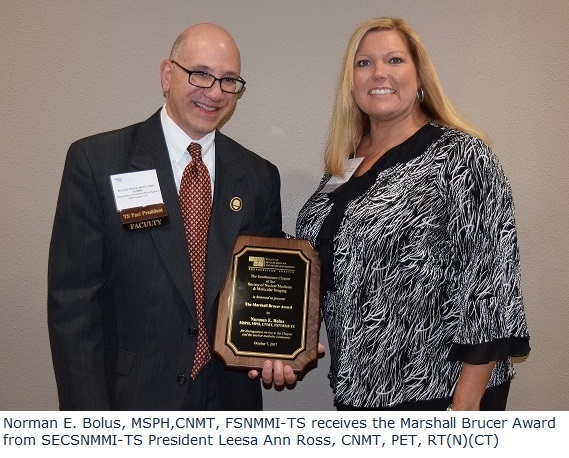 For the Southeastern Chapter, Bolus has served as treasurer and president of the SECSNMMI-TS, co-program chair numerous years, newsletter editor and, currently, chair of the Finance Committee. On the national level, he has served on many SNMMI and SNMMI-TS committees, including education, publications, and continuing education. Bolus was a founding board member of the Nuclear Medicine Advanced Associates (NMAA) Council and was a member of the Uptake Newsletter Editorial Board prior to becoming editor-in-chief of the Journal of Nuclear Medicine Technology (JNMT) in 2012 for a five-year term. In June 2017, he was named SNMMI-TS president-elect. Bolus has bachelor’s degrees in biology and in nuclear medicine technology and master’s degrees in public health in occupational health and safety (emphasis on radiation safety) and in public health in environmental toxicology—all from UAB. He has published 19 peer-reviewed articles and 32 additional articles, contributed to nine books as a chapter author or editor and co-authored two books (including the 4th edition of Steves Review of Nuclear Medicine Technology, which is the primary review book used by NMT students preparing for their board exams). He has also given over 100 presentations. Bolus is a member of ASNM, SNMMI, the Health Physics Society, American Society of Nuclear Cardiology and the American Society of Radiologic Technologists. He is also a member of the DOTmed HealthCare Business Editorial Advisory Board. His dedication to the field of nuclear medicine has also garnered other professional honors. Bolus is an SNMMI-TS Fellow and the recipient of both the SECSNMMI-TS Distinguished Service Award and the SNMMI-TS Outstanding Educator Award.